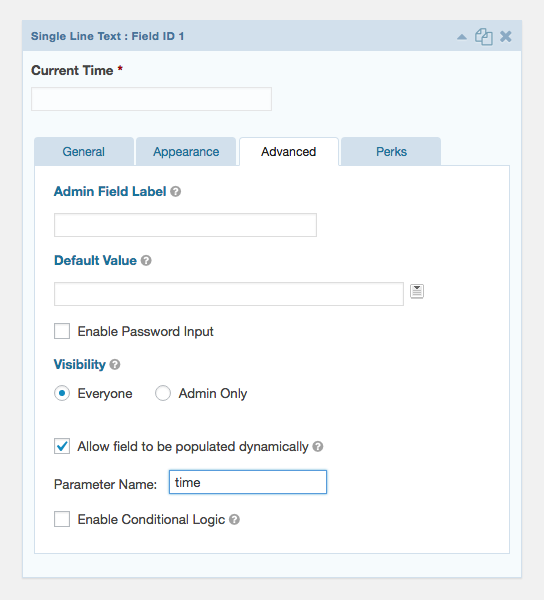 This tutorial will demonstrate how to show/hide fields via Gravity Forms’ conditional logic based on the current time. This functionality can be used anywhere conditional logic is available. We will be populating the current time into a field on the form via Gravity Forms dynamic population. We will then create conditional logic rules based on the value of this dynamically populated field. Add snippet to populate the current time. Setup your time-based conditional logic. First, we’ll add a hidden field to our form. Let’s label this field “Current Time”. Now we’ll need to make a few configurations to this field so that it will be dynamically populated with the current time. 2. Add snippet to populate the current time. Now that your Current Time field is configured, we need to copy a small snippet to your theme’s functions.php (or any place you’re able to include custom code). This code will dynamically populate the Current Time field with the time in a 24-hour decimal format. Here are some examples of how some times will be converted. 3. Setup your time-based conditional logic. 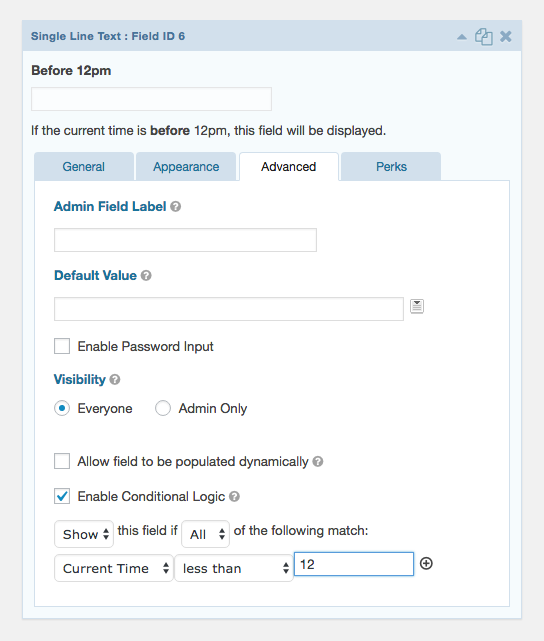 Our Current Time field will now be populated with the numeric time value each time the form loads. Let’s setup conditional logic for a field based on the value of our Current Time field. In the demo, we have two Single Line Text fields. The first will be visible if the time is less than 12pm and the second will be visible if the current time is after 12pm. There are an infinite ways this can be used! Don’t forget that this works anywhere Gravity Forms conditional logic is supported. Do you still have any questions about how to get this setup? We’d love to know what they are. Leave a comment below. Hey, David. Do you have a link for GF Notification Scheduler? A Google search did not turn it up. I need a solution where a notification is sent to a particular email address between the hours of 5-7pm. Can this solution do this? Would this be per submitted entry? If so, we have an early access perk available to Gravity Perks customers called GF Notification Scheduler which sounds like a good fit. When using “current time”, the WordPress Time is considered? What about ensuring the user completed the form in a certain amount of time (ie 4 days) and what considerations need to be made for if they clicked “Save and Continue” ? Hi Guy, we don’t have a solution for this one.